Katie was a normal American teenager when she decided to explore the possibility of voluntary work overseas. She temporarily 'quit life' to serve in Uganda for a year before going to college. However, returning to 'normal' became impossible and Katie 'quit life' - college, designer clothes, her little yellow convertible and her boyfriend - for good, remaining in Uganda. In the early days she felt as though she were trying to empty the ocean with an eyedropper, but has learnt that she is not called to change the world in itself, but to change the world for one person at a time. By the age of 22 Katie had adopted 14 girls and founded Amizima Ministries which currently has sponsors for over 600 children and a feeding program for Uganda's poorest citizens - so it is no wonder she feels Jesus wrecked her life, shattered it to pieces, and put it back together making it more beautiful than it was before. About "Kisses From Katie: A Story of Relentless Love and Redemption"
Beth Clark is a writer and publishing consultant who has ghostwritten four top-ten New York Times bestsellers. She runs a business called Thinkspot Communications in the rolling hills of Franklin, Tennessee. Customer Reviews For "Kisses From Katie: A Story of Relentless Love and Redemption"
By age 22, Katie was Mum to 14 little girls in Uganda. And the crazy thing is, she was just an ordinary girl like you and me. There is no limit to what God can accomplish through a broken, willing vessel. I read this book 1 month after coming to Christ. I cried through every page of this book. My heart was wrenched as I saw how deeply Katie loved the lost and the broken. How she wrestled with God's goodness in the midst of suffering. How the world offered her everything, but she counted it as loss compared to knowing Jesus. But most of all I was broken because of this: Jesus' call over Katie's life to love and serve the lost, is the same call over yours and mine. Through this book I was called to mission, and my life has never been the same since. This book will change you, shape you, challenge you. But more than that it will show you God's immeasurable love for you and humanity. You will see people through God's eyes; it will be transforming and beautiful. It will bring you hope and draw you closer to Him. I pray you are blessed by this book as countless people have been! Apart from the fantasy of the book, it's a great read. Very raw and explains first hand what her life was like then. I would recommend this book! Katie shares her amazing story in such an uplifting and real way. Reading this book will inspire you to live the unique life God has gifted you in a way that brings God glory and allows you to be a part of "more than you could ever imagine!". The title originally made me think it might be a bit wishy-washy but I was wrong! It's a powerful book! Wow - This book will challenge you, inspire you and draw you ever closer to God. 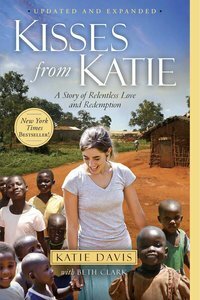 The story describes how Katie responded to God's call to live out his Gospel by working among the poorest people in Uganda. Yet this is not simply a book about Africa, or being a missionary. Rather, it is about a life in God's Will, being totally dependent on Him, living solely for Him and loving each person we meet with His own love. This is definitely a must-read for everyone aged from 13 to 113! I just love this book. And more importantly - the story. Katie is a miracle. She is the most Christ-like, serving person I've ever heard of, and her story is an inspiration to me. She always attributes anything to God - and doesn't want the applause to be for her - but for God. This book is sitting in my bookshelf and will be read in the years to come, for inspiration to move; and a nudge that I'm meant to do more to serve. She said in an email thing she sent out that not everyone needs to move to Africa! She says we should serve where we are for the people who are in our surrounds. For her, that meant people in Uganda, as she lives there now. I really love this book and am also heart-wrenched by the stories in there of suffering in Uganda. It makes me want to do better, and donate more money to good causes - including those in Africa, as well as doing things to help my community and surrounds.